Power Sphere is an epic Neutral creature card. 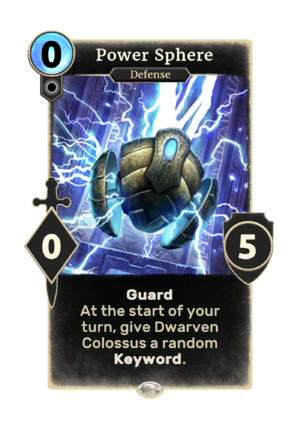 It cannot be obtained as part of your collection, but it is instead summoned by Dwarven Colossus. This card's trigger applies the Powered Up card effect. This page was last modified on 24 September 2018, at 23:08.